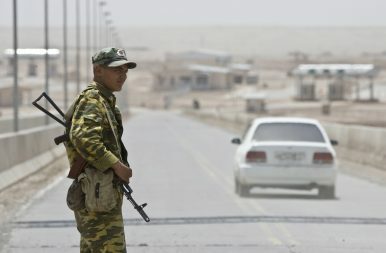 A frontier guard stands on a bridge to Afghanistan across Panj river in Panji Poyon border outpost, south of Dushanbe, Tajikistan, May 31, 2008. Meanwhile, poor border security opens the door to drug trafficking, one of the Taliban’s main sources of funding. According to Sadat, “Smugglers use Afghanistan to produce opium, and then send it across the borders through Pakistan and Central Asia to Europe, to Russia.” In return for protecting, and in some cases physically aiding, poppy growers, the Taliban receives a 10 percent cut of sales. The poppy trade is estimated to generate $500 million per year in revenue for the Taliban. What do Afghanistan’s border guards see as the main obstacles to securing the frontier? And what will it take to turn the tide? To answer these questions, I spoke to 13 members of the Afghan Border Police and five members of the Afghan Customs Department during the UNDP’s annual border management training course in Dushanbe, Tajikistan. The group was diverse – geographically, ethnically, linguistically – yet time and again interviewees hit the same points: Afghanistan’s borders are under-resourced, beset by corruption, and defenseless in the face of foreign meddling. The interviewees, many of them mid-level officers who have seen combat, had strong opinions about the path forward for Afghanistan. Taking these perspectives into account is critical as the Trump administration prepares to ramp up U.S. involvement in this now 16-year-old war. Of Afghanistan’s 34 provinces, 16 are border provinces. The sheer length of the border demands a constant investment of manpower, weapons, equipment, and vehicles. But officials say the resources are simply not there. “Our problem is that we are under-resourced,” says 1st Lt. Gulrahim Zubair of the ABP, based in Kunduz. Kunduz, a provincial capital in northern Afghanistan, was recaptured by the Taliban in 2015 in a major setback to the NATO-led war effort. “We don’t have enough equipment. Not enough cars. No modern weapons. Not enough tanks and Humvees. We don’t even have replacement tires. And we don’t have enough people,” the first lieutenant says. Sadat believes the answer lies in the United States and NATO assisting Afghanistan to build up its air force. But while the United States has helped train Afghan pilots, it has been slow to donate aircraft to the country. A year-long push to get India to deliver spare aircraft parts has yet to bear fruit. For now, managing the Durand Line remains the job of Afghanistan’s understaffed ground forces. Desperate to boost troop levels, the ANA recently raised the recruitment age from 35 to 40 and launched an ad campaign aimed at young people. But for Stanikzai, these efforts miss the point. He blames the ANA’s low recruitment on poor wages and lack of compensation for families of soldiers who are injured or killed. Of the officers I spoke to, nearly all of them identified corruption as a major challenge to policing the border. Corruption is a double-edged sword for border police. From a security perspective, border guards who accept bribes from militants, drug smugglers, and human traffickers perpetuate insecurity at the border, making their own jobs more difficult. On a more fundamental level, the perception of corruption in the military undermines trust in the state and pushes people into the arms of the Taliban, who are perceived to have always punished corruption harshly. The reasons for corruption in the military are complex, going beyond mere greed. Soldiers and police officers are aware that engaging in corruption places themselves and their colleagues in greater danger. Nevertheless, some take bribes out of economic necessity. Zubair, the first lieutenant from Kunduz, is surprisingly candid about his reasons for accepting bribes. Sadat of the ACD is sympathetic to this argument. Stanikzai of the ACD relates the issue back to poor wages and lack of compensation, which force soldiers to find alternative sources of income. In addition to economic pressures, there is pressure from above. When higher-ups in the government and security services lean on those below them, it creates a domino effect in which victims must themselves turn to corruption. “Corruption will only go away when we eradicate it from the top,” he says. Afghanistan is ranked 169th out of 176 countries in Transparency International’s 2016 Corruption Perceptions Index. In opinion surveys, Afghans consistently identify corruption as one of the biggest challenges facing the country, along with insecurity and unemployment. Afghanistan’s border problems are over 100 years in the making. The country initially served as a buffer zone between Britain and Russia’s colonial holdings in South and Central Asia. In 1893, British diplomat Sir Mortimer Durand and the Afghan emir signed a one-page document establishing a border between Afghanistan and British India, which Pakistan inherited after the 1947 partition. As is so often the case with borders conceived in European offices, the Durand Line failed to take local factors into account. “There were people living in the region for a long time, but they drew a line right through them,” says Gholami, who polices the Afghanistan-Pakistan border from Helmand Province. The Durand Line cut through Pashtun tribal areas to the north and Balochistan to the south, politically dividing members of these ethnic groups. As a result, there remains heavy traffic across the border to this day, a fact that militants exploit. The border remains a source of friction between Afghanistan and Pakistan. The countries periodically engage in diplomatic spats and armed clashes, complicating cross-border policing efforts. But it is Pakistan’s illicit support for the Taliban that most threatens the peace. “Pakistan works with the enemy. They work with the Taliban, al-Qaeda, all the terrorist groups. They let them come and go because they want to keep Afghanistan weak,” he says. But Pakistan is not the only neighbor with a presence in Afghanistan. What happens if Afghanistan builds the dams? Reports suggest that Iran’s Islamic Revolutionary Guard Corps (IRGC) has provided weapons and financial aid to militants in Afghanistan’s western provinces. In addition to seeking concessions from the Afghan government, Iran hopes to undercut the U.S. mission in Afghanistan. The Afghans I spoke to also point a finger at their Central Asian neighbors. Some 30 percent of Afghan opiates pass through Central Asia, and the Tajik government extracts billions of dollars from smugglers in return for looking the other way. Afghanistan is also a major destination for Tajik, Turkmen, and Uzbek militants, with Central Asian governments either unable or unwilling to stem the flow. Caught between the machinations of their neighbors, it is easy for Afghans feel that their fate is out of their hands. “Do you know the game buzkashi?” asks Zubair. Buzkashi, sometimes referred to as “Dead Goat Polo,” is a contact sport popular in Afghanistan and Central Asia in which teams of men on horseback compete to throw a goat carcass into a hole in the ground. In June, the Trump administration announced that it would send an additional 4,000 troops to Afghanistan to help train the ANA. The new troops would join 8,400 U.S. soldiers already stationed there. In his appearance before the Senate Armed Services Committee last month, U.S. Defense Secretary James Mattis faced criticism from Arizona Senator John McCain regarding the administration’s lack of strategy to accompany this surge. Mattis acknowledged that the U.S. military mission in Afghanistan had entered a “strategy-free time” but promised to produce a comprehensive South Asia plan by mid-July. To date, however, the Trump administration has not released its strategy, reportedly because President Donald Trump is reluctant to sign off on it. It is unclear how the U.S. plans to address issues such as under-resourcing, corruption, and foreign meddling. The absence of a comprehensive plan has failed to inspire confidence among the Afghans I spoke to. Many expressed frustration with what they perceive as American disinterest in promoting economic and governance reforms or seriously confronting Afghanistan’s neighbors. With the Taliban ascendant and Afghanistan facing one of its most violent summers in years, members of the ABP have few illusions about the challenge they face. For Zubair, however, there is reason for optimism. We are sitting on a bench in the courtyard of the OSCE Border Management Staff College in Dushanbe. The other trainees are drinking tea and chatting under the shade of a tree. It is a strangely idyllic scene considering the work they will soon return to. I ask Zubair if he really thinks the war can be won. Names in this article have been changed to protect the individuals who discussed sensitive topics and work in dangerous areas. Bardia Rahmani is a graduate student at Columbia University, where he focuses on civil wars and post-conflict reconciliation.